Please note that these samples are smaller & lower quality than the download product. Yes, I am trying to earn money... but I am definitely not here to rip-you-off. I'm an honest musician trying to earn an honest dollar for something that can really help you. I learned to slap the hard way. My experience can help you grasp ideas faster than I ever did. Beginner to pro bassists have said some really nice things about FunkyChops™ . Publications like Activebass and REDzine have given FunkyChops™ great reviews. What's the Price of Fun? Professional bass lessons cost around $30 for a half-hour.... how much can you learn in that time? With FunkyChops™ , you'll learn tons at your own pace. You can only purchase this product from me. I am the copyright owner and the only person legally allowed to sell FunkyChops™. Please note that the download version contains lower quality video than the cdrom version to save download file space. ClickBank will, at its option, replace or repair any defective product within 60 days from the date of purchase. Instant download features video & audio instruction that's different. No theory, no tab, just 100% funk. See below for real customer testimony from beginner to pro bass players. Hi, my name is Jim Lee. I'm an artist, musician, educator & more. I play the bass, drums, guitar & other instruments too. I've been in many bands, from blues to punk. Anyway, if you want to learn slap bass riffs, I can help. Most bass instruction is theory oriented and boring... I wanted FunkyChops™ to be easy & fun. 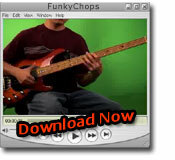 FunkyChops™ is a play-by-ear method that requires no note reading or prior slap bass knowledge. Each riff features audio & video played at 3 speeds. I play a riff and you say “cool, can you play that slower?” ... no problem, you hear it played slower and then you imitate. This is how I learned, except you'll be learning much faster than I ever did. I'm showing you slowly, how to play slap riffs that blaze. Plus, you'll improve your ear-playing skills which will make you a better bassist. After you pay, you'll be able to instantly download the web version of FunkyChops™ 101 Funky Slap Bass Riffs, vol.1. This slap bass video instruction works with Windows & Mac computers. Download is simple & easy. Buy it now, there's nothing to lose... 100% satisfaction guarantee. You can't get this anywhere else.